As soon as Dra. Anne took note of my sun spot skin concern, she headed on towards a series of questions on my lifestyle. Mainly pertaining to the frequency of sun exposure in my daily grind. I later appreciated how thorough she was before she jumped right on to a solution. I had a few options, one of which is chemical peeling, which provides the fastest result. But because I had a client call happening the next couple of days, there was no way it was feasible, since chemical peel will mean that I’m to visibly peel and I have to practically stay indoors and stay out of the sun. I’ve done this years ago and I know what it’s like. That takes it out of the question. 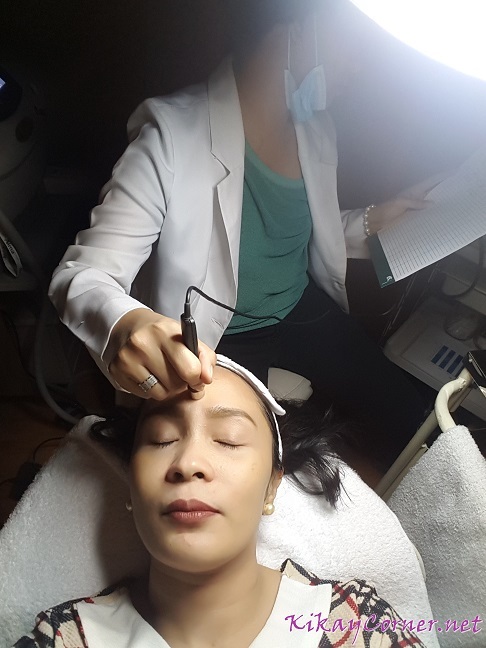 After some deliberations, we agreed on laser treatment for my sun spots with TyRo White line to support the treatment. 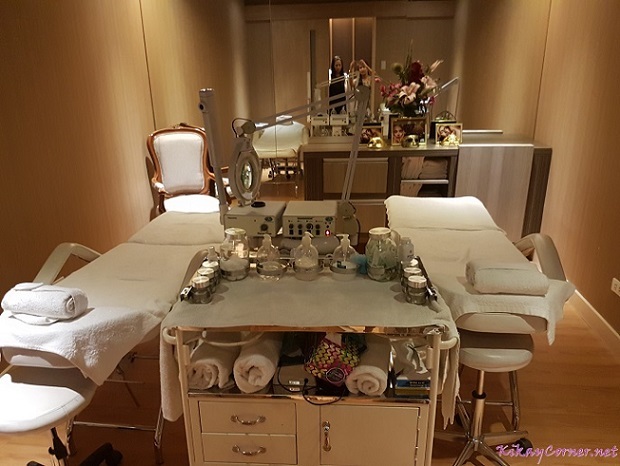 Inside the Diana Stalder Treatment room. Dimmed lights, soft pipe-in music, royal, ultra relaxing ambiance. Might as well doze off to dreamland. With the help of my trusty and favorite cushion (that I have yet to blog about), sun spots, blemishes and problem skin get filtered off. I love it! But a clear and zero blotch canvas, that would be the bomb! The first thing that was done on me as soon as I was on my back in the treatment room was facial cleansing. In all the laser treatment sessions I’ve had, an aesthetician cleansed my face with vanishing cream. Every single time, I make sure to request to do away from erasing my brows. It’s hard enough to get those drawn. Besides, I’ll sure refuse to step out of the beauty clinic with blank brows. Haha! As soon as my face is thoroughly cleansed, Dra. 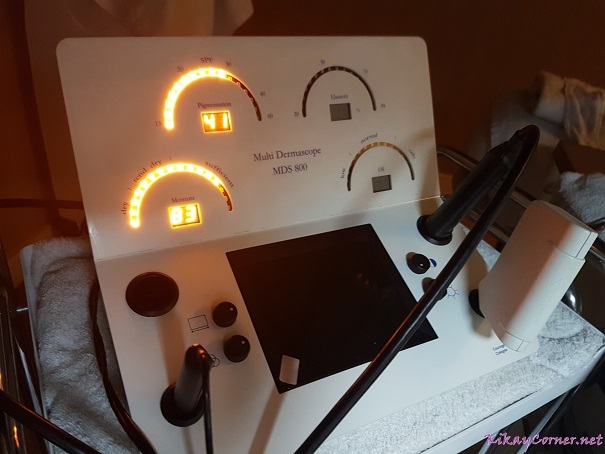 Anne would come in to probe on different parts of my face with this Multi Dermascope contraption. 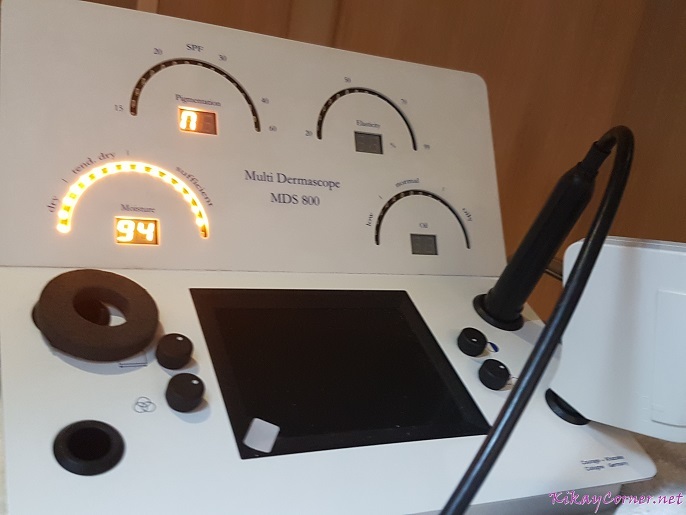 The Multi Dermascope measures hydration, sebum, elasticity, pigmentation and comes with a camera for skin imaging. I measured quite high on the Sun Protector Factor as Dra. Anne took my skin’s pigmentation measurement. The highest I got was a 50! Yikes! This means I should use a minimum of SPF50 on my sunscreen. My pigmentation measurement was pretty bad. Dra. Anne made sure she reiterated to me the value of sun protection. It stuck to me so well that from then until now, I’ve been in the habit of reapplying my cushion (with SPF50) every four hours. My hydration measurement was close to perfect! 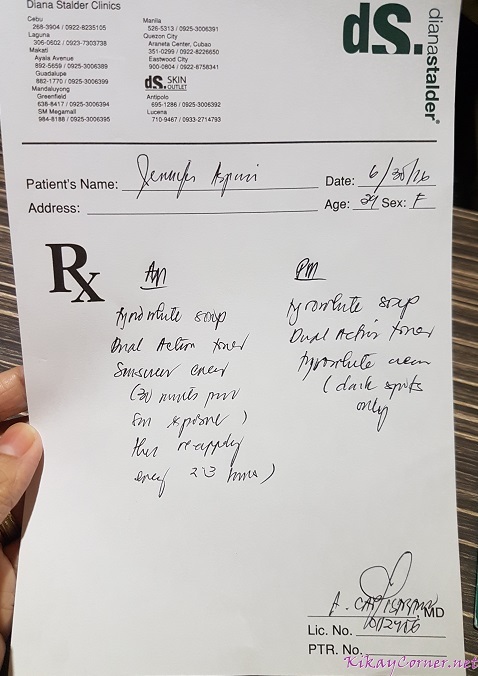 For someone who’s turning 40 in a few months, I was given a vote of approval from my pretty doctor, that I’m doing a great job in the hydration department. 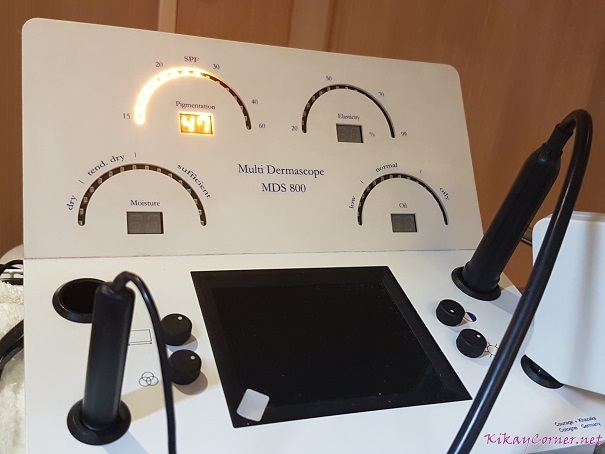 This nifty contraption measures and interprets results of hydration, sebum and elasticity and can be used to aid identification of the correct products and treatments. 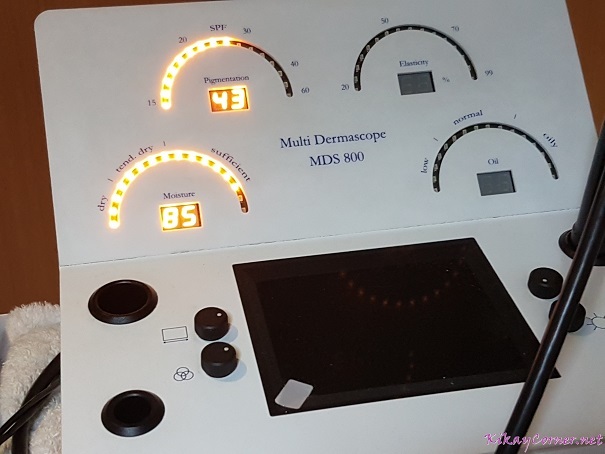 In all my years of doing skin reviews, this is the first time that I’ve encountered such a device. This makes a lot of sense to me such that the analysis won’t have to be subjective alone, an objective analysis will make it all the more reliable. From Sun Protector Factor SPF50, my skin was down to having a need of SPF43 on my second session. Although my hydration went down to 85 from its 94, it was still sufficient. It may have to do with the soap that I switched to. That said, it’s always good to have excellent moisture for procedures like this. Making my buffer more than enough to accommodate change of products that will help reinforce the treatment. Better by the session. From my previous SPF43, my need for sun protection is down a couple of notch more, at SPF41. Although hydration is two notches down as well, you’ll see from the dial that it still reads, “sufficient.” Again, taking good care of our skin pays. That wide buffer, keeps my skin well moisturized. Ultrasonic Gel Application before laser. I was also made to wear an eye protector against the laser beams. 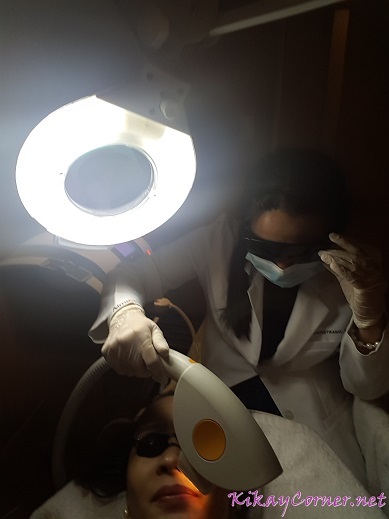 Laser zapping on those nasty sun spots and spider veins begins! It’s easy to see that the sun spots around the area of my cheekbone has considerably lightened each session. Kindly gnore the difference of the lighting of each photo. It’s always a challenge to keep the same distance of the light to the face every session. 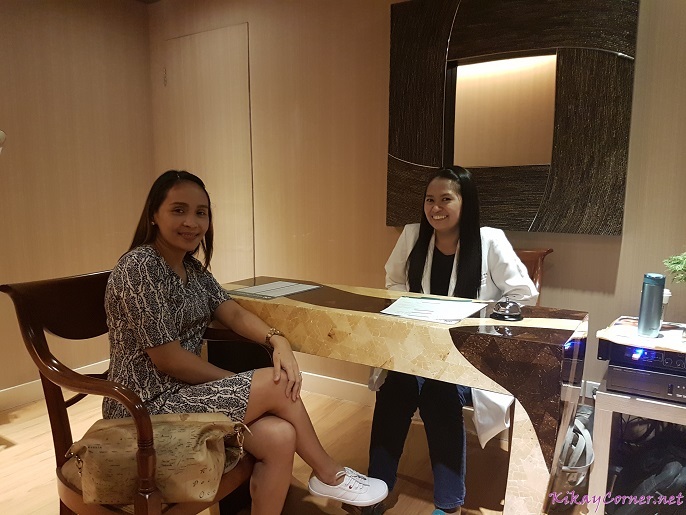 Diana Stalder’s Laser Treatment addresses a host of skin issues and are proven to offer key advantages for both doctors and patients. • Safe, effective and no downtime. 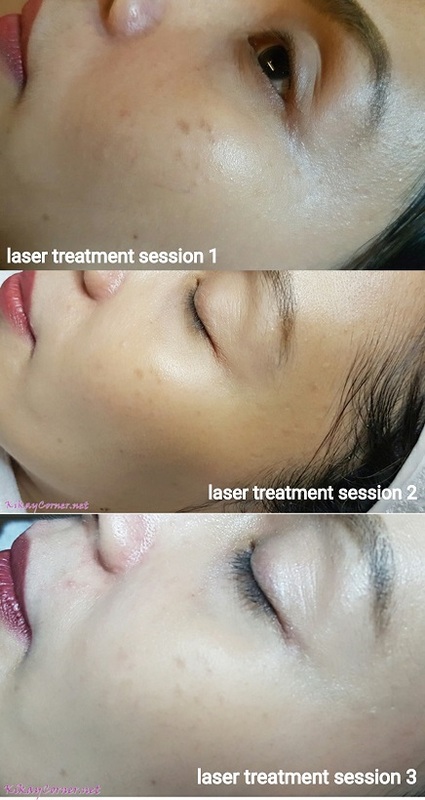 While my sun spots haven’t completely vanished just yet, I am thrilled enough to see them fade away by each laser session. I’m looking forward to getting rid of them altogether. Thanks to the trustworthy hands of Dra. 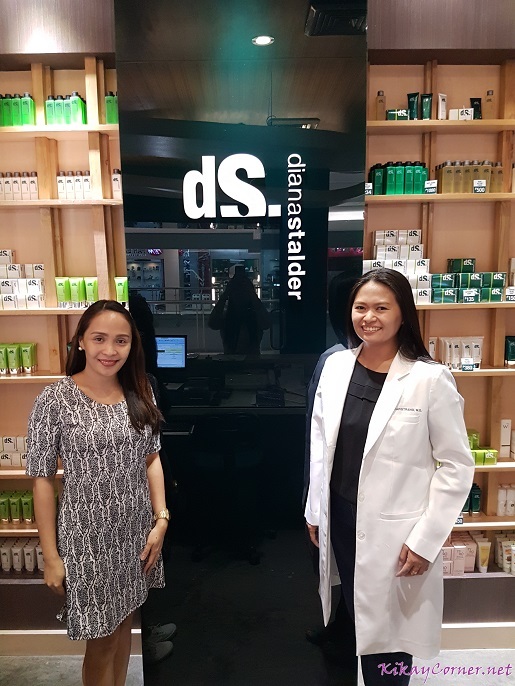 Anne and the expertise of Diana Stalder to make sure skin care issues are dealt with effectively. Diana Stalder Face Body Surgicenter by Dermaline, Inc. is the nation’s pioneer in Facial and Skin Care Centers. 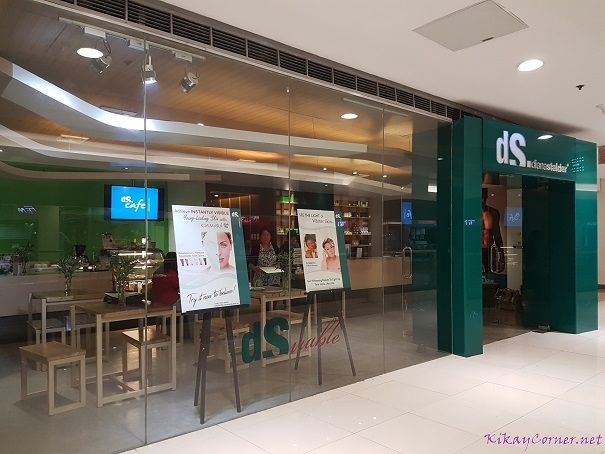 Started in 1996, Diana Stalder currently has 25 branches and counting, all strategically located nationwide: seven corporate and 18 franchise branches. Metro Manila branches are located in SM Megamall, Quezon City, Gateway Mall and Makati City. Yes naman! Mawala na ang sunspots and spider veins wag lang ang kilay!